Get ready for an unparalleled home fitness experience with Georges St. Pierre’s RUSHFIT. Tough MMA-style conditioning will reshape your body, helping you build lean, powerful muscle, cut fat, and get in great cardiovascular shape. RUSHFIT can be modified for different fitness levels, accessible to motivated beginners while still challenging to advanced exercisers. You don’t have to be an MMA fan to appreciate RUSHFIT. You don’t even need to know who GSP is, however, you will likely come to appreciate this tremendous athlete’s humility and humor throughout the course of the program. It’s pretty amazing to have the opportunity to train alongside one of the fittest athletes on the planet. It feels like you have a smaller version of his training camp right in your living room. The RUSHFIT program is designed by GSP’s trainer, Erik Owings, who holds multiple black belts himself and is an experienced personal trainer. Owings provides detailed, easy-to-follow instructions and GSP demonstrates a full-on attack of each movement while providing an entertaining and informative commentary alongside Owings’ technical instruction. RUSHFIT provides you with everything you need to radically change your body. It’s challenging. It’s brutal. You will sweat buckets and you will probably curse, but you will see and feel real results very quickly if you go hard during the rounds. Strength and Endurance Workout DVD: An intense strength and endurance circuit which utilizes a combination of body weight and dumbbells with various exercises such as squats, lunges and get-ups. Abdominal Strength & Core Conditioning DVD: Core-blasting exercises that address strength, balance, power, and stabilization of classic core areas such as abs and low-back while also involving often-overlooked core areas such as hip flexors, glutes, and shoulder stabilizers. The Fight Conditioning Workout DVD: Real MMA fight techniques such as takedowns, locks, and strikes performed at an energetic cardio pace. These movements will build your cardiovascular endurance and full-body coordination. No dumbbells are used in this bodyweight-driven workout, but I felt it just as much the next day! Full Body Strength & Conditioning DVD: Five rounds of intense full-body strength training exercises which will fatigue every major muscle in your body. Introduces uniquely effective exercises combining body weight with dumbbells which you won’t find elsewhere. Explosive Power Training DVD: Non-stop plyometric sequences which challenge your speed, strength, and endurance. Unique when compared with other plyometric workouts in that dumbbells are employed. Probably the most difficult DVD in the set, which is saying a lot since each is very challenging in its own way. This workout is especially fun because you really get to see GSP’s explosiveness in action. Bonus Workout DVD—Balance & Agility + Stretching for Flexibility: These two bonus workouts are a welcome addition which really round out the RUSHFIT program. You’ll increase your range of motion and improve body control and coordination, which helps prevent injury while speeding up recovery time. I found these workouts to be great for recovery days. Workout Guide: A nicely put-together and visually appealing 20-page booklet which breaks down the structure of the RUSHFIT program, provides helpful tips, and gives you more information about Georges’ and Erik’s backgrounds. Includes a fitness assessment which helps you choose the correct program for your fitness level as well as track your progress. Nutrition Guide: A super-helpful 21-page booklet which takes the guesswork out of nutrition during these intense 8 weeks. It’s detailed and accurate without being overwhelming. Even details what to eat before a workout and after a workout, including proper protein-carb-fat ratios. Includes different BMR calculation formulas for men and women and explains how to lose weight by creating a calorie deficit in a way that’s easy for a beginner to understand. Training Calendars: Provides a roadmap for the 8-week program. Three options to choose from: beginner, intermediate, or advanced. 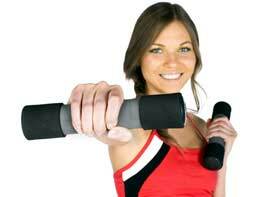 The Workout Guide helps you select which program is best for your current fitness level. Required Equipment: You’ll need to supply your own dumbbells, ranging from 5lbs to 25lbs depending on your fitness level. Since RUSHFIT relies on maximum reps, not maximum weight, there is no need to go any heavier than 25lbs. You may want to have a few different weight options on hand at home since you will likely graduate to a heavier weights as you get stronger. I also recommend getting some weight lifting gloves to improve traction when gripping the weights during moves such as the dumbbell swing and also provide a cushioning effect when you brace on the weights for push-ups. Each DVD workout begins with an excellent 11-minute warmup which stretches and warms up all the major muscle groups. You’ll do a sequence of exercises which get the blood flowing in all areas of the body, including air squats, lateral lunges, even a fun move from capoeira called the ginga. In all likelihood, you’ll begin to break a sweat during the challenging warm up, which you can feel OK about since Georges does as well. Next comes the meat of the program, the actual workout, which is broken down into a five-round sequence modeled after the structure of an MMA fight. Each round consists of five intense minutes followed by sixty all-too-quick seconds of active rest where GSP and Erik keep you moving while imparting workout wisdom, allowing you to grab a quick drink and towel off the sweat which I guarantee you will need to do frequently. The sequences truly address the functional strength of the whole body rather than just show muscles such as biceps or abs. Core strength is emphasized again and again, and as Owings reiterates, the core consists of not just the abdominal area; it also includes the glutes, hip flexors, shoulder stabilizers, etc. A powerfully conditioned core is the key to GSP’s amazing athleticism and will benefit you as well, regardless of your sport. If you follow the program for the full 8 weeks, you will definitely see major changes in your body’s appearance, and you will feel great improvements in strength and stamina. The workouts are grueling indeed, but Georges’ personality makes them easier to get through than they would be otherwise. Personally, I feel OK about being sweat-drenched and out of breath if one of the world’s top athletes is right there next to me in a similar state! The 11-minute warm up and 7-minute cool down sequences consist of the same footage on each DVD. Since you’re working out every day, this got a little repetitive (I made it more entertaining for myself by memorizing GSP’s lines and trying to beat him to the punch). That being said, both the warm up and cool down are highly effective and designed specifically for RUSHFIT, so I can’t really complain. I always enjoyed what Georges had to say, so it was kind of a bummer when taskmaster Erik had to (understandably) cut him off in order to keep the workout moving. RUSHFIT truly delivers on its promise to help you “build muscle, cut weight, & get in shape.” If you’re trying to lose weight, remember that muscle weighs more than fat, and be aware that RUSHFIT will definitely pack a good deal of lean muscle onto your frame. Keep in mind that the number on the scale is not necessarily representative of your fat loss. Pay more heed to your before and after measurements as well as your clothing size. To derive the full benefits RUSHFIT has to offer, make sure to do all the scheduled workouts in the timeframe laid out in the Training Calendars and be sure to follow the nutrition guide. The importance of nutrition cannot be overemphasized, especially if your primary goal is fat loss. Go hard during the rounds, since even though RUSHFIT is extremely challenging, the rounds are over pretty quickly if you really get into it. As GSP says, training itself often feels terrible, but you’ll feel amazing after the session is over. As with any workout program, you’ll get out what you put in. If you’re ready for tough no-holds-barred workouts aimed at maximum results in a short yet intense time slot, I would highly recommend RUSHFIT. Getting through one DVD, let alone 8 weeks, will require dedication, mental strength, vigorous physical effort, and lots of sweat, but the results this program is capable of providing are well worth your time and effort.